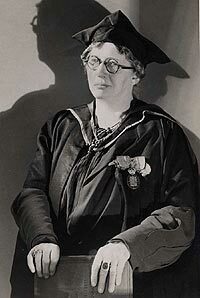 Lilian Baylis was an English theatrical producer and founder and manager of a ballet company. She helped her aunt, Emma Cons, operate the Royal Victoria Hall and Coffee Tavern, which she converted into the Old Vic theater after Con's death in 1912. She came through in a seance mourning the destruction of the Old Vic. She explained that she no sooner found herself dead than she realized she was really alive. Language, she explains, is useless in trying to describe her new conditions.